SAFE Sheep stud farming at Nuwepos in the Karoo is showing all the signs of success as the Dorper sheep breeding programme continues. SAFE’s decision to venture into sheep farming at Nuwepos, the company’s 108 ha farm near Vanrhynsdorp on the Oliphant’s River more than a year ago, is showing all the signs of success. This is attributed in part, says Farm Manager Pieter Krynauw, to the fact that “we bought great quality stock from the beginning”. “Our selections are done at a very high standard with professional help to breed only the best quality standard Dorpers”. SAFE launched the project late in 2017. 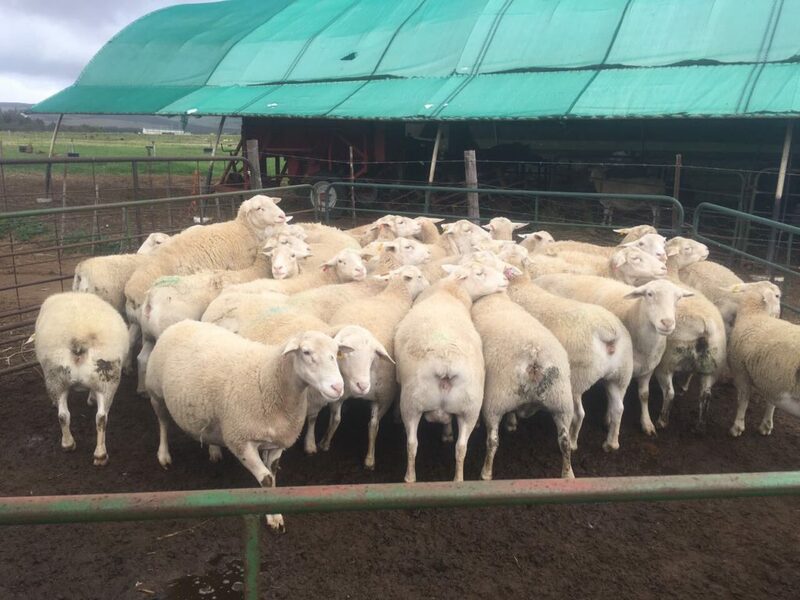 “It began as a community enterprise development project, in partnership with the farm workers who were already involved with the commercial sheep farming operation at Nuwepos,” according to Dries van Rooyen, SAFE’s General Manager of farming operations. At the start of the project, SAFE acquired 70 Dorper ewes and two rams and established the infrastructure necessary – including lambing pens. A worrying factor at the time was the drought – but confident of rain the project went ahead. “We did experience some relief in July this year with limited rain, but unfortunately we are still in a drought situation and need a very good winter to recover in full,” says Pieter. According to Pieter, the aim is to create a strong gene pool. “This should take three to four years, by which time we expect the venture to be turning a profit. Sales have been good with 161 lambs sold to the meat market this year. Pieter has also selected the first stud rams that will be sold on auction next year when they are about 18 months old. “We are happy that we are beginning to become self-sufficient – breeding our own rams. This means that we will need to buy fewer in the years to come. According to Dries, stud farming takes time. “At the moment we are following a very strict selection process in order to offer a very high quality of Dorper to the market and to promote Nuwepos as a reputable stud farm”. Aware of their commitment to the local community, a number of Nuwepos farm workers have been attending courses on Dorper farming. “Although they are familiar with commercial sheep farming, stud farming is much more intensive and there is a lot to learn to achieve a level of success. “We remain confident of achieving our aim,” says Dries, “to achieve one of the main objectives of the Dorper stud project at Nuwepos – which is to encourage and promote community enterprise development. Cutting edge technology “tests the wind” for SAFE in staying on top of crop disease.